Here you can learn about 1stDrive.com and Paul the driving instructor behind it. There’s only me working here because I focus on teaching people to drive and being the best instructor I can. I’m not interested in growing my school to make money. My own bad experience of learning to drive made me decide to start teaching. The instructor I had was awful. As well as shouting and getting angry they taught me things on my driving lessons that were totally incorrect. They even lied by pretending they’d booked me a test but they hadn’t. My instructor clearly just wanted to drag my lessons out for as long as they could. Instead of teaching me properly they bodged it up and only taught me enough so I could scrape through the test. They even sold me a dodgy car that was a deathtrap and due to all that I had a crash soon after passing my driving test. 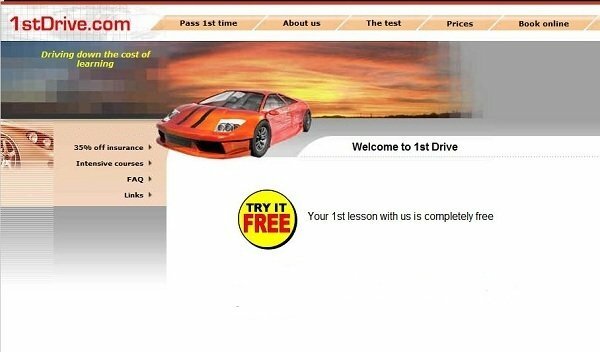 I was taking an I.T course at college while I was taking my driving lessons. I discovered a talent for using computers at a young age and started writing video games when I was 11 which I sold to the other kids in the playground. The problems I’d experienced when learning made me decide to give up my I.T career and become a driving instructor. I vowed that I would never purposely teach people incorrectly as had happened to me. That crash could have killed me and all because of someone not doing their job properly. I didn’t want that to happen to anyone else. I wasn’t old enough to teach others yet so I had to wait four years after passing my driving test before I could start my training. That’s one thing that makes me different to many instructors; most people see an advert for this job and just end up doing it to make money. Road safety and making people safe drivers isn’t their main concern, they just endure the job to make ends meet. To me being a driving instructor has never been just a job. I remember phoning up schools and asking if there was any way I could start sooner even though I wasn’t old enough. These schools got pretty tired of me calling up but I was very keen. To start with I even did free lessons for a few years before I started teaching professionally just to gain experience. The day before I was due to take my final exam to become a driving instructor something happened. I was out practising with my instructor trainer on a driving lesson when a yob walking down the street thought it’d be funny to throw a brick at us. The brick smashed the side window where I was sitting and hit me on the head. It was lucky I wasn’t injured more than just having a cut above my eye. My car wasn’t in shape for taking a test now that it was damaged. What’s funny is that it wasn’t the brick that did most of the damage to my car. My trainer, a very experienced instructor, tried to turn the car around and go after the yob. Unfortunately he didn’t follow one of the basic rules of reversing (looking out the back window) and drove straight into a lamppost! None of that put me off. If anything it was a preview of the madness that I was to encounter over my years of teaching. The yob did nothing but make me even more determined to pass and become an instructor. And so I did. Finally I’d done what I’d waited years to achieve. I was so happy that day that I felt like nothing could go wrong so I went and put £50 on a horse. It was an outsider at odds of 20/1. I’d never even bet before but my horse won and I had £1000 burning a hole in my pocket. I was chatting online at the time to someone I’d only known for 2 weeks. They suggested I go and stay with them. Not only was it this going to be a great holiday but a great way to celebrate achieving what I’d wanted for so long. 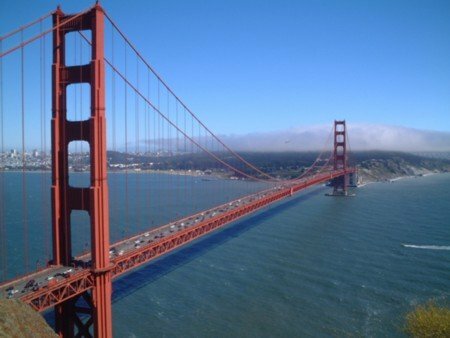 I was on a plane to San Francisco the next day and had some great adventures over there with my friend and her cats. I’ll never forget being on a plane circling over New York city at night on my way home in 2003. Looking down at all the beautiful lights and the tiny distant cars it felt like anything was possible. I’d only just become an instructor though and going solo is a huge step. This was my first visit in 2003 (I went back in 2004 and 2005) and it was to be two more years yet before 1stDrive began but I could already feel that it would happen. After I got back from holiday and everything settled down I started doing driving lessons for national driving schools. This was a good way to gain experience but It soon looked to me that these schools were more interested in making money. Some were about sales targets and not helping people learn to drive so I decided to leave. Memories of that night in circling over New York in America came back to me and I remembered how I’d felt. I just had to have my own driving school. I needed a name before I could launch my school. I’d spent weeks thinking and I just couldn’t come up with a good one. Dragon? Quick Drive? One way? I even considered calling it something really offensive so that it would upset people and get me on the local news for some free advertising. In the end I didn’t. At first I just used my own name as the name of the school but I had a few problems with that. An internet search revealed that I share my name with the worlds former number one football hooligan who had been imprisoned many times. He has over 60 recorded offences for promoting football riots, dealing with drugs and causing trouble all over Europe. I received emails asking me why I’d gone straight, when the next planned riot was and how come I was a driving instructor when I was supposed to be in prison! Do a Google search for “Paul Dodd football hooligan” if you want to learn more about that character. Eventually I was so sick of coming up with names I just thought of the most basic thing. It had to have “1st” in it so it’d be listed early in printed directories because that’s how it worked before the internet was king. It also had to have the main word that I wanted which was “drive”. First to Drive? Drive first? 1stDrive? Surely that name had gone, it was too obvious. After looking it up online it was available! I Quickly grabbed my credit card and registered it. 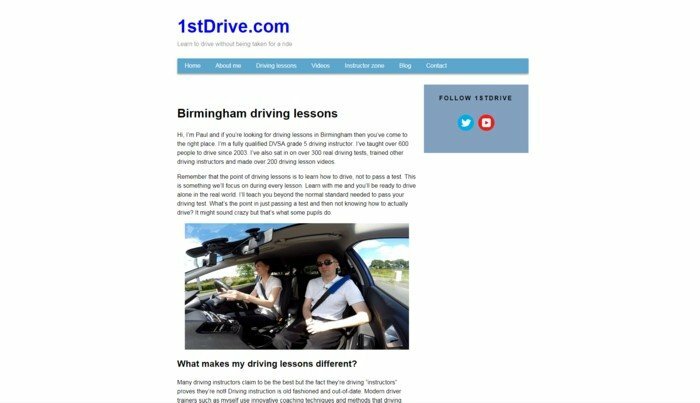 1stDrive.com launched on 1st April 2005. It took me weeks to make the first version of the website, you can read more about that below. This website is written, designed and maintained by me (Paul) and that’s why I can put the real truth on here such as pages talking about driving school scams. After just days of launching I was fully booked for weeks ahead and it’s been the same ever since. My site has grown in popularity over the years and pupils have traveled from as far away as Holland to take driving lessons with me. I’d already had some exciting adventures so far and advances in technology meant there was about to become a way to share my adventures with the world. An idiot was driving too closely behind me when I was doing a driving lesson one day. He wasn’t paying attention and crashed into us. It wasn’t our fault because we weren’t even moving but the other driver refused to accept any blame. Three other cars had crashed into the back of him and the case went on for just under two years. You can watch a video about the crash by clicking here (coming soon). At this time I decided to invest in my first in-car CCTV system to protect me from any other idiots in the future. Years ago but they used to be huge, clunky devices that recorded onto VHS tapes. You had to have a big box under the passenger seat and keep winding the tapes back. Funny things often happen around me while I am teaching so I had the idea of making these idiots work for me. The problem was that two years ago I had lost the password for my 1stDrive YouTube channel. I’d forgotten which email account it was registered to so I couldn’t reset it. One morning I woke up and remembered the password! I started uploading videos of funny things to my YouTube and had no idea how popular it would become. I started getting a few dozen views and a few people subscribing. The next time I looked I’d had a few hundred views and then a few thousand and then a few hundred thousand! My inbox was full with hundreds of comments, hundreds of thumbs up and people around the world were loving my videos. This video celebrates my one millionth view on a video! I made over 100 videos in the next 12 months and became really popular. I had changed my camera set-up three times from SD to HD, a higher quality HD and then to twin full HD cameras. People were emailing me asking me to make videos of all sorts of things to do with driving. Here is how 1stDrive.com looked in the past. Until 2006 it was just a black and white site. So simple! Then I progressed to the more modern design in 2007. That sports car; everyone kept emailing asking if that’s what I taught in! In 2009 I moved on to mark 3. This was when 1stDrive.com really took off and I regularly had over 8000 visitors a month with the help of this site! November 2012 and it was time for mark 4. I gave the site a fresh new look, made it mobile friendly and built up the driving instructor zone. August 2016 and it was time to update my site with a modern look. I used a new design with a much clearer menu system and modern coding making it more compatible with mobile devices without the need for a separate site. Where do I go from here? Why not follow my YouTube channel and see?